Game Developer Magazine is a prominent periodical for game industry folk to read up on their craft. 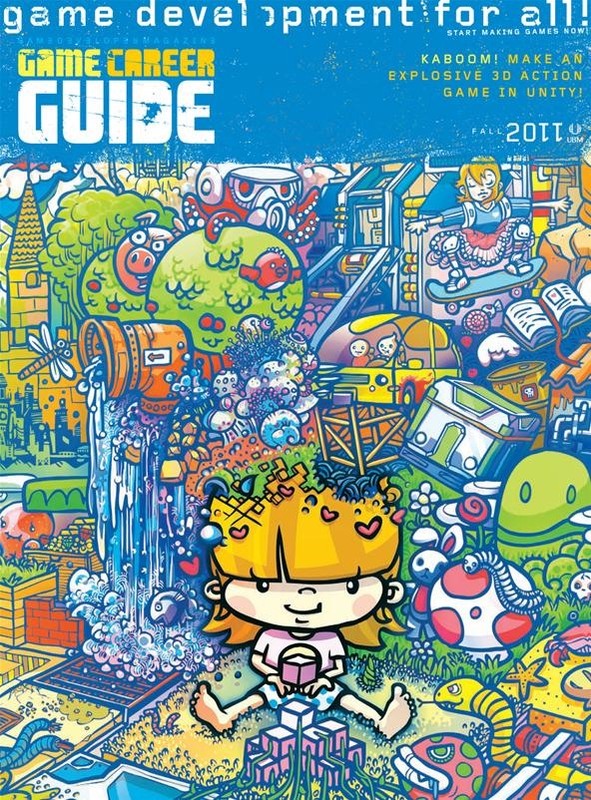 For those who don't work in games, it can be a little dry, but every year they release a Game Career Guide devoted to welcoming other people into their world. Best of all, it's free! You can view the newest issue just released here in your browser, or download the PDF version. Tutorials on Unity3D, pathfinding, pixel art, and pitching games to publishers. Lists of game conferences to help educate yourself, game design competitions to enter your games for judgement, and colleges and universities in the US and abroad offering game-related programs, from Associate's degrees to doctorates. An in-depth look at the team and development process behind Octodad, the IGF 2010 winner produced by students at DePaul University. If you're at all interested in making a game, even if you don't see yourself becoming an industry man, go download this magazine. It's accessible, useful, and most importantly—free. Best of luck gentlemen. I hope your games are awesome.